* Large LCD display with bar graph. * Lux or Foot-candle unit selection. * 4 light type select. * DC 1.5V battery ( UM-4, AAA ) x 6. LCD size 52 x 38 mm, 4 digits. Unit Lux, Foot-candle ( Ft-cd ). correction filter, spectrum meet C.I.E. Cosine correction factor meet standard. Zero Adjustment External adjustment by pushing button. Peak Hold To hold the peak display. Memory Save the max. & min. value with Recall. Power Off Auto or manual power off. Data Output RS-232 serial data output. Operating Temperature 0 ℃ to 50 ℃ ( 32 ℉ to 122 ℉ ). Power Supply DC 1.5 V battery ( UM4, AAA ) x 6 PCs, or equivalent. Power Consumption Approx. DC 8 mA. Weight 357 g/0.79 LB. * Battery is included. Dimension Main instrument : 174 x 68 x 42 mm ( 6.9 x 2.7 x 1.7 inch ). Accessories Instruction Manual. 1 PC. * 4 rings conductivity probe, high performance, wide range, professional. DisplayLarge LCD display, 21.5 mm digit height. Measurement & Range4 ranges : 200 uS, 2 mS, 20 mS, 200 mS.
1 uS for 200 uS range. 0.001 mS for 2 mS range. 0.01 mS for 20 mS range. 0.1 mS for 200 mS range. Display shows ” 1 “. 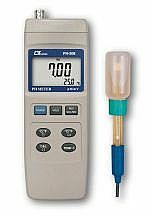 Data Hold To freeze the measured pH value on the display. 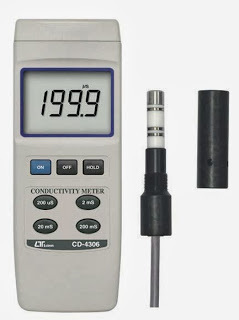 Temperature Compensation automatic, 0 to 50 ℃ (32 to 122 ℉). Temperature compensation factor fix on fix on 2% per ℃. Calibration VR Build in external calibration VR. Operating Temperature 0 to 50 ℃ (32 to 122 ℉). Power Supply DC 9V battery ( heavy duty type ).006P, MN1604(PP3) or equivalent. Power Current Approx. DC 5 mA. 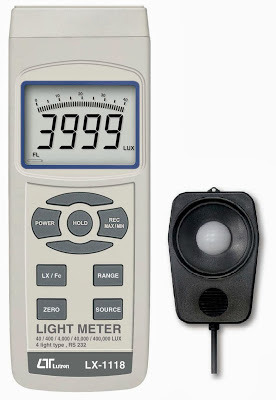 Weight 270 g/0.60 LB ( w/battery & electrode ). DimensionMeter : 200 x 68 x 30 mm (7.9 x 2.7 x 1.2 inch ). Electrode : Round, 20 mm Dia. x 124 mm length.